“The Handmaid’s Tale” star Yvonne Strahovski is a mom for the first time! 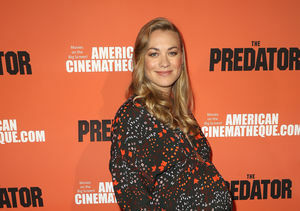 Last month, Strahovski accidentally slipped that she was expecting a baby boy with husband Tim Loden. During a red-carpet interview at the Emmys, she told E! News, “Just gonna hold him in there and hope for the best." Emmy Confession: ‘Handmaid's Tale’ Star Yvonne Strahovski Is Married!